Robin Brooks, who until March 2017 was Goldman's chief FX strategist (and provided countless hours of entertainment for FX traders who had a habit of fading his recos), recently moved to the Institute of International Finance where he has focused more on the fund flow side of global macro and capital flows, a very relevant topic in light of the ongoing Emerging Markets rout. So, in this context, in a recent tweet, Brooks touched on a very interesting topic: is the current Emerging Market rout better or worse than the Taper Tantrum of 2013. His answer, visualized below, shows that (in addition to an odd surge in the UAH in recent months), it is for now impossible to determine with any certainty, whether the Feb-May 2018 rout has been more violent than the Taper Tantrum, although for certain nations, like Argentina, Turkey, and as of today, Brazil, the answer is rather obvious. What is potential for contagion from Argentina & Turkey to rest of EM? Chart compares non-resident portfolio inflows in 3 years to now (2015-7) to 3 years before taper tantrum (2010-2), both in % GDP. Inflows have generally been slower (many below diagonal), which is good. 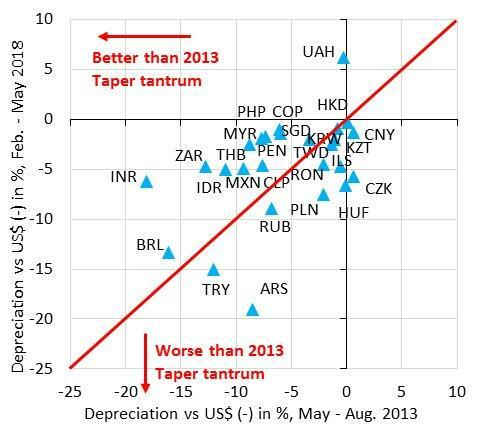 Conventional wisdom is that broad EM is now in better shape than ahead of 2013 taper tantrum and that Argentina and Turkey are outliers. 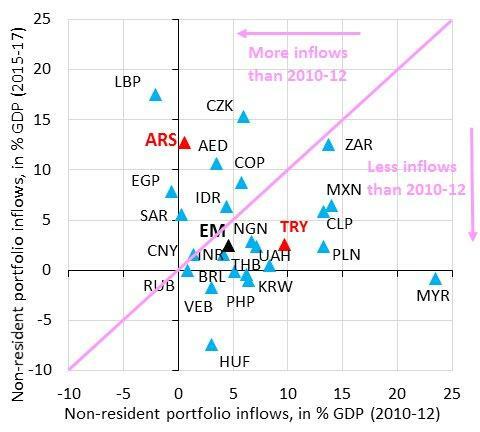 That may be, but I am still struck how sharp the rebound in non-resident portfolio flows to EM has been post-2015/6. The rebound in non-resident portfolio flows to EM isn't just about China recovering from the 2015/6 devaluation scare. 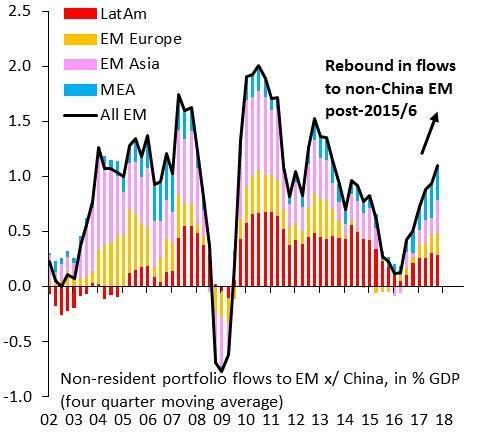 Chart shows flows to EM excluding China, which have risen back to 2013 levels. Has there been enough discrimination in these flows?